Flawfinder is a source code auditing tool that reports possible security weaknesses (flaws) sorted by risk level. It’s very useful for quickly finding and removing at least some potential security problems before a program is widely released to the public. It’s a static analysis source code auditing tool. Also it works on Unix-like systems today (it’s been tested on GNU/Linux), and it should be easy to port to Windows systems. It requires Python 1.5 or greater to run (Python 1.3 or earlier won’t work). 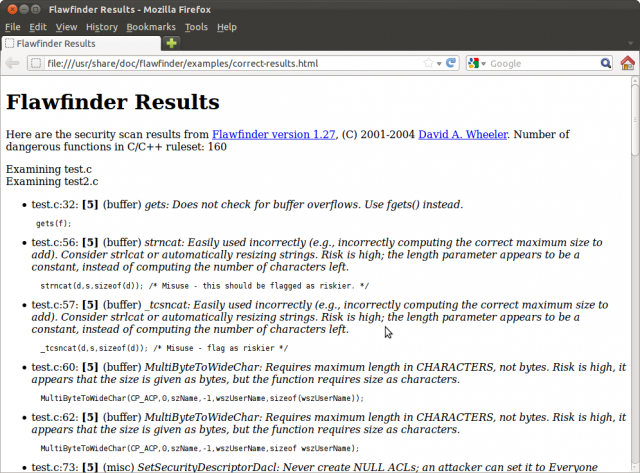 Flawfinder is written in Python, to simplify the task of writing and extending it. Python code is not as fast as C code, but for the task I believe it’s just fine. The earlier version 0.12 on a 400Mhz Pentium II system analyzed 51055 lines in 39.7 seconds, resulting in an average of 1285 analyzed lines/second. Flawfinder 1.20 and later will report their speed (in analyzed lines/second) if you’re curious. Flawfinder works by using a built-in database of C/C++ functions with well-known problems, such as buffer overflow risks (e.g., strcpy(), strcat(), gets(), sprintf(), and the scanf() family), format string problems ([v][f]printf(), [v]snprintf(), and syslog()), race conditions (such as access(), chown(), chgrp(), chmod(), tmpfile(), tmpnam(), tempnam(), and mktemp()), potential shell metacharacter dangers (most of the exec() family, system(), popen()), and poor random number acquisition (such as random()). The good thing is that you don’t have to create this database – it comes with the tool. It then takes the source code text, and matches the source code text against those names, while ignoring text inside comments and strings (except for directives). It also knows about gettext (a common library for internationalized programs), and will treat constant strings passed through gettext as though they were constant strings; this reduces the number of false hits in internationalized programs. Another interesting tool to put in the bag. What language(s) does it scan? Can I throw any source files at it, or is it just for C/C++? Andrew: Yes, flawfinder will only find flaws in C and C++ at the moment.